Here at Luttrell Surgical we are always looking for recipes that are easy to prepare, nutritious and most importantly, delicious. Maintaing a healthy diet throughout the season will be a little easier with this Holiday Recipe – Game Hens with Brussels Sprouts and Chestnuts found at Eating Well. Having a healthy diet is the best non-surgical weight loss method, and is also necessary to get the full benefits after weight loss surgery. At Luttrell Surgical, we know the temptations you will face during the Holiday season, but there is no need to dread having to fight the urges of eating unhealthy food, because you will happily indulge in this delicious dish. With this recipe, you may even convince your friends and family members that eating healthy is the most satisfying and rewarding lifestyle to follow. In this recipe, game hens are even easier to prepare than chicken and help make your celebration more festive. Their buttery flavor complements roasted Brussels sprouts and chestnuts. Shopping Tip: Cooked peeled chestnuts are available in jars in the baking aisle or with seasonal foods at many supermarkets. Per serving: 313 calories; 7 g fat (2 g sat, 2 g mono): 93 mg cholesterol; 39 g carbohydrates; 24 g protein; 6 g fiber; 656 mg sodium; 875 mg potassium. Nutrition Bonus: Vitamin C (140% daily value), Potassium (25% dv), Folate (23% dv), Vitamin A and Iron (15% dv). 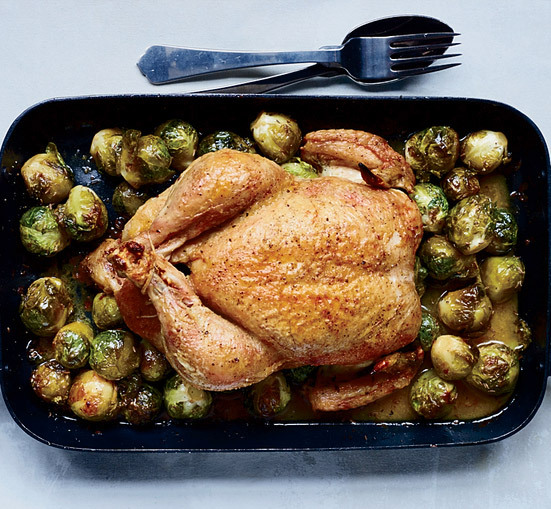 Follow this link to to get the complete Holiday Recipe – Game Hens with Brussels Sprouts and Chestnuts at Eating Well. How to keep from gaining winter weight?